I was curious to see if I could identify some patterns of collaboration and research topics in cow health research made in Canada. 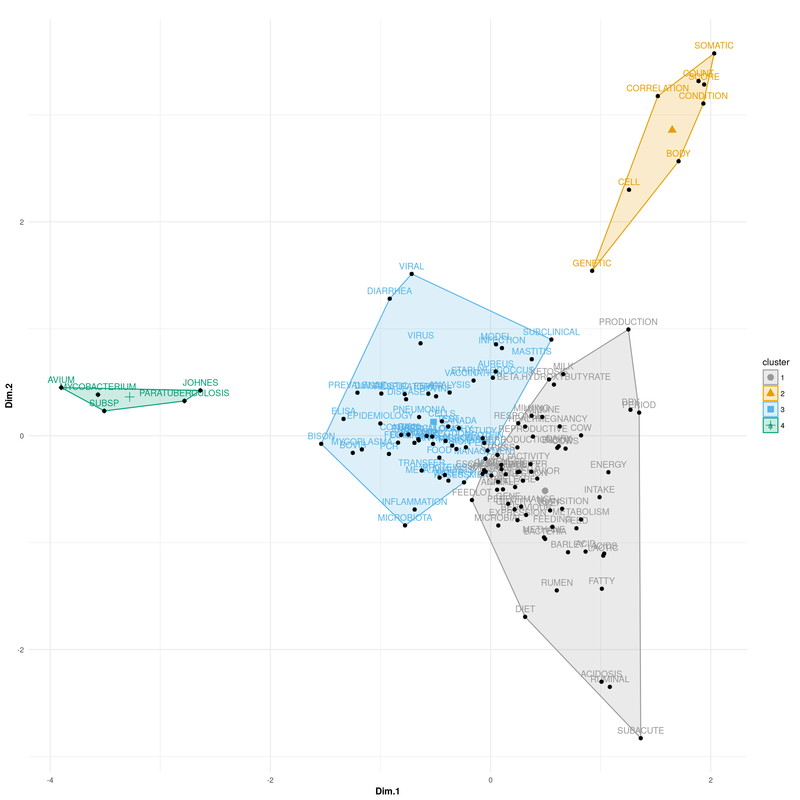 For this, I’m trying the R package bibliometrix. This package allows quantitative research in scientometrics and bibliometrics by providing different routines for importing bibliographic data from Scopus and ISI Web of Knowledge databases, and performing various bibliometric analyses. The Bibliometrix website provides a good tutorial that I will mainly follow, with the sole objective to satisfy my curiosity and have fun! Then we can load the R package and read the data! So we’ve got 1569 articles and 114 reviews, from 5157 authors. Thanks to stringr package, I could fix the address information of the authors to get the following graphs. 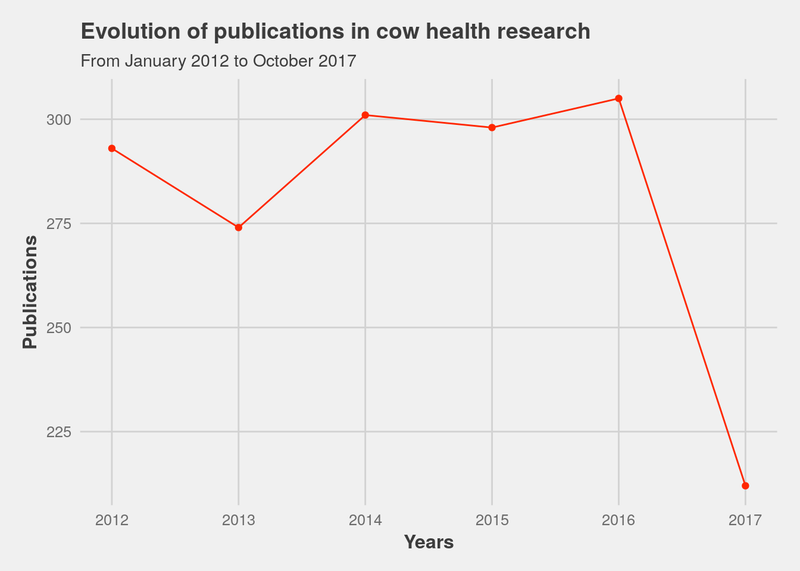 Figure 1: Evolution of publications in cattle health research. 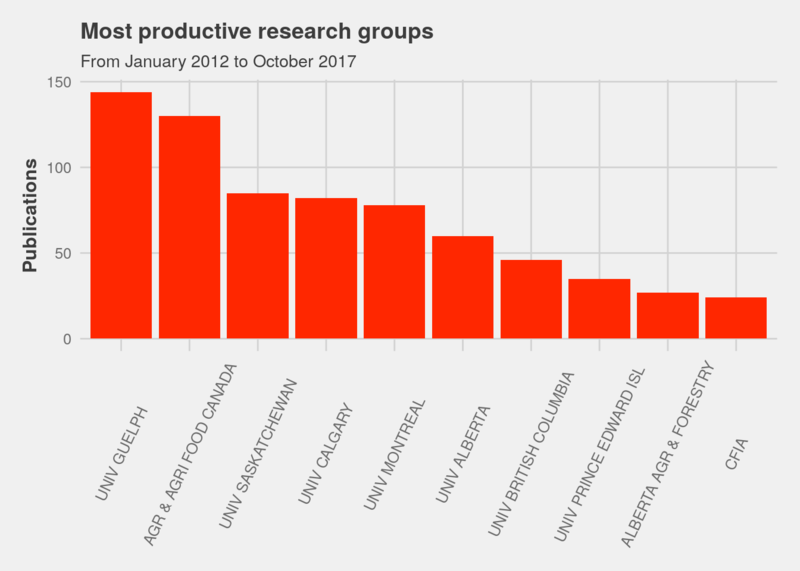 Figure 2: The 10 most productive research groups. Note that 2017 is not over yet, so explaining the drop in the number of publications in the first figure. The most productive group is the University of Guelph, closely followed by Agriculture and Agri-Food Canada. Dominance factor (DF) can be computed, according to the formula of Kumar & Kumar, 2008. This factor gives an indication of the collaboration in the field, as a ratio of the number of multi-authored articles in which a scholar appears as first author to the total number of multi-authored articles. A value of less than 0.5 reflects a good sign for collaboration; high value shows more dominance of author as first author. All authors in the field look like they’re quite collaborative. Buczinski (Université de Montréal) and Stanford (Alberta Agriculture & Forestry) dominate their research team because they appear as first authors in a large proportion of their papers (10 out of 26 for Buczinski and 9 out of 28 for Stanford). The h-index tries to measure both the number of publications a researcher produced (“quantity”) and their impact on other publications (“quality”). Here’s my own and the ones from the 30 most productive authors, in this collection. My h-index is 3 (all time 11 on Google Scholar, and I have 3 other papers in press, not yet included in this collection, and you need some time for papers to get cited). Barkema, Orsel (University of Calgary), LeBlanc, Leslie, Kelton, Chapinal (University of Guelph), McAllister, Rushen, Beauchemin (Agriculture and Agri-Food Canada), Weary (University of British Columbia), and Miglior (Canadian Dairy Network) have the largest h-index among the top 30 most productive authors. However we see h-index of zero for Von Keyserlingk (University of British Columbia), De Buck (University of Calgary), and De Passillé (Agriculture and Agri-Food Canada). My guess is that their name is wrongly filtered, resulting in a wrong computation of their h-index (Von Keyserlingk and De Buck have 42 and 21 on Google Scholar, respectively. Couldn’t find De Passillé). 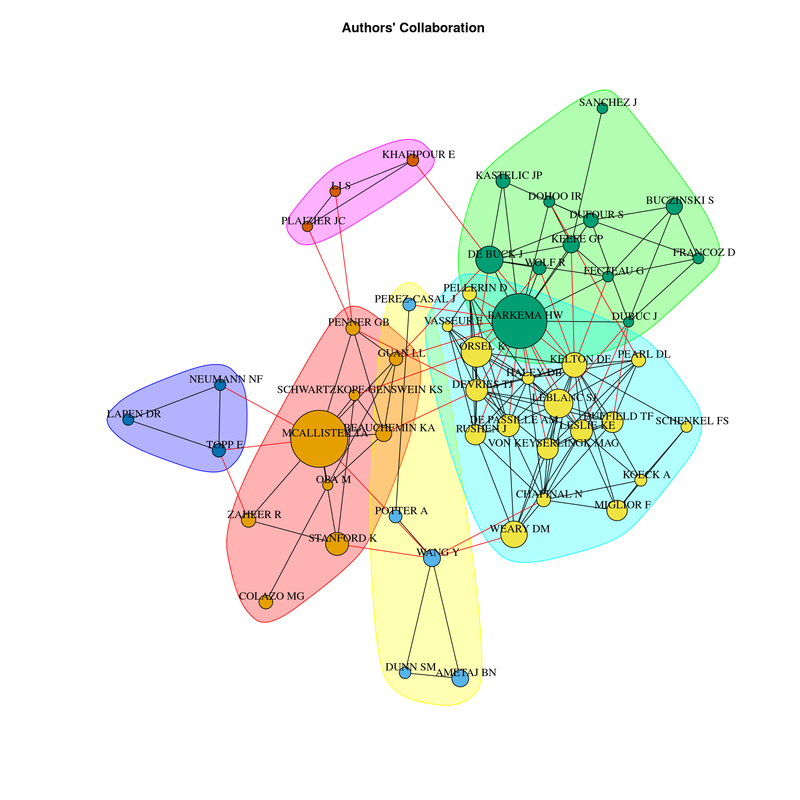 This is where it’s getting interesting: analysing the networks based on the attributes of the bibliometric data. Different communities appear, around 2 PIs: Barkema and McAllister (remember from above, these two are very productive and have a low DF). Barkema is centered across 2 communities (in green and yellow). Interestingly, the blue community is mainly from eastern Canada (Université de Montréal, University of Prince Edward Island), while the green one is more western (University of Guelph, University of Calgary, University of British Columbia). In both case, authors are working on a variety of topics: clinical diseases (i.e. Fecteau, Francoz), epidemiology (i.e. Dohoo, Pearl), production (LeBlanc), animal sciences (Pellerin, Vasseur), animal welfare (De Vries, Von Keyserlingk), etc. But in most cases, it looks like they’re doing field work. While around McAllister, it looks like it’s more lab work. This would need digging deeper, but it’s a rough first approximation. 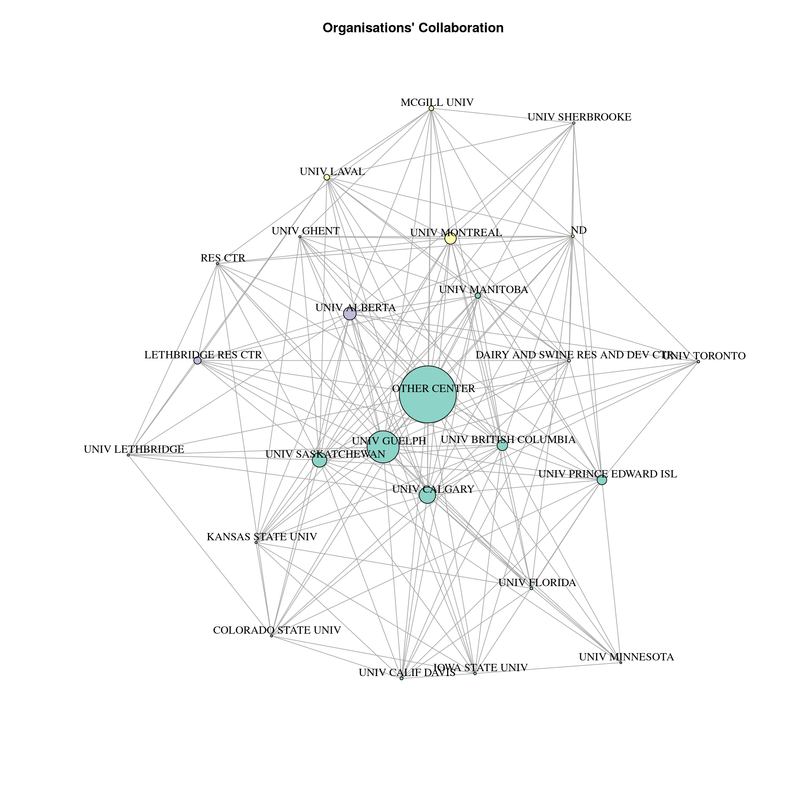 Collaboration is mainly realised between Canadian institutions, with only one from Europe (University of Ghent, Belgium), and 6 from the US (Kansas State University, Colorado State University, University of Florida, University of California in Davis, Iowa State University, and University of Minnesota). 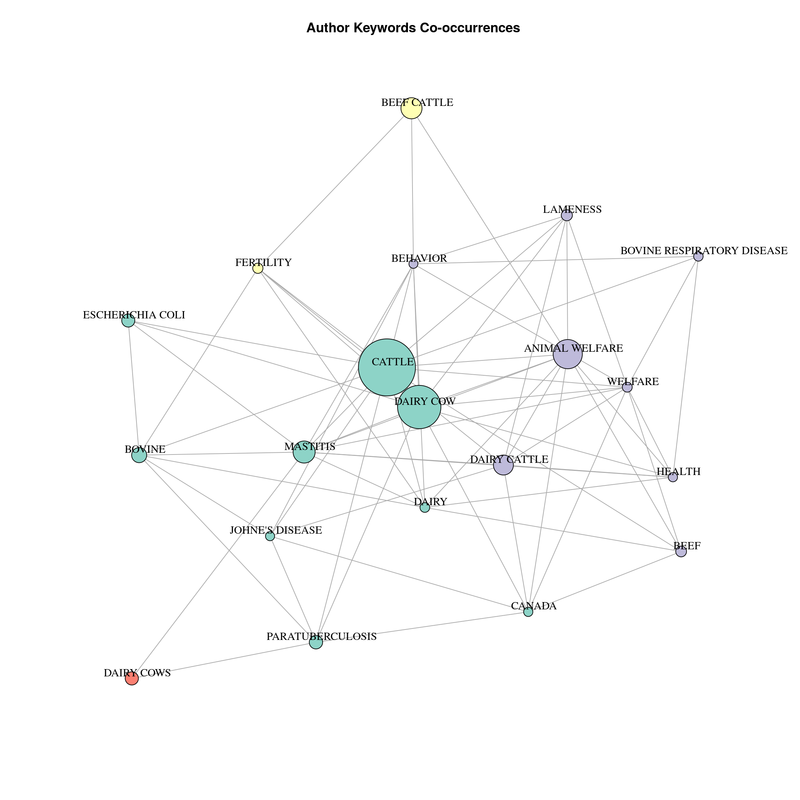 Figure 5: Author keyword co-occurrences. According to keywords provided by the authors, we find the usual research themes in cattle health: mastitis, welfare, lameness, Johne’s, BRD. Here we’re mapping the conceptual structure of the field using the word co-occurrences in the bibliographic collection, by performing a MCA and K-means clustering to identify clusters of documents which express common concepts. Figure 6: Conceptual structure of the field. Four fields emerge, one specific to paratuberculosis, one for contagious diseases, one for production diseases and performances, and one probably for genetics. This was a rough tentative of exploring Canadian research on cattle health.